*It's 10:49am and I smell popcorn. I wonder if I forgot to feed someone breakfast. *This week we have a birthday for one of my kids. *This week we have a concert for one of my kids. *This week we have another concert for another one of my kids. *This week we have 3 different dentist appointments. *Thursday was National Cupcake Day. Did you know that? I'm a good blogger - telling you about it a few days late. I made cupcakes for my family. *Did you know they make snowman Peeps? Now you do. *I miss blogging. And taking fun pictures. And feeling "normal." *I think I'm going to stay in my pj's for all of January, curled up in bed playing on pinterest and catching up on your blogs. I miss you. *I just changed my mind. I'm going to spend all of January on a beach somewhere, not connected to the internet at all. *Don't take that personally. I still miss you. But a beach sounds better than my bed. *We have a bunch of people coming over in just a bit and I'm still in my Mickey Mouse lounge pants... a.k.a. "Work Attire." *It's funny how you can want something so badly and when you get it, it's different than what you thought it would be. *I'm not complaining. At all. Just saying, things can be different than you expect. I am close to the beach! Wow, you have a busy week ahead. I think the beach, unconnected, sounds perfect. 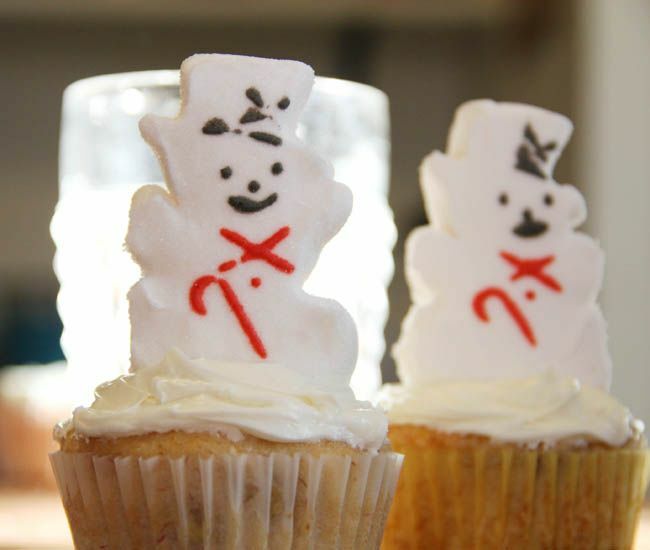 And snowman peeps, gotta get me some of those! i'm with ya on the blogs...SO behind. lots of people are taking blogging breaks but not me!